Valentine’s Day is coming up soon, so we’ve been doing different projects at home with our six-year-old to get ready for the holiday. 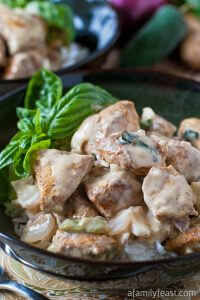 These quick and easy Peppermint Hearts were our Valentine’s cooking project this past weekend. 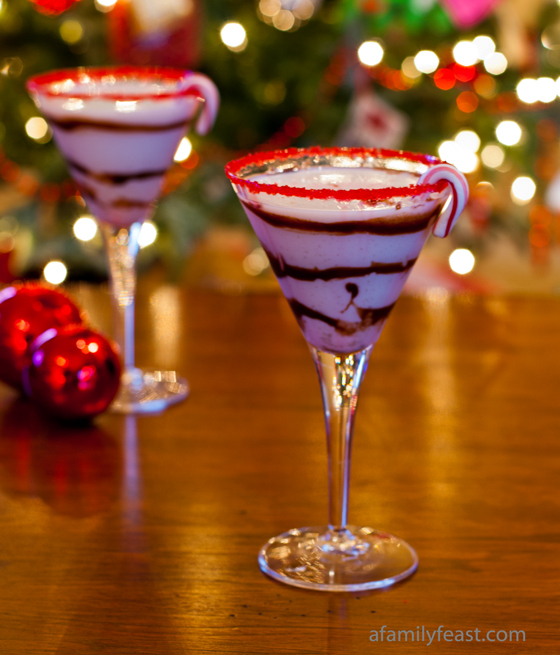 We’ve had a bag of candy canes tucked away in the kitchen cabinet since making our White Chocolate Peppermint Martini‘s over the holidays, and hating to throw out perfectly good candy, I wanted to make something with the leftovers. I remembered seeing this recipe on Pinterest where peppermint bark was made in the shape of snowflakes (so pretty!) 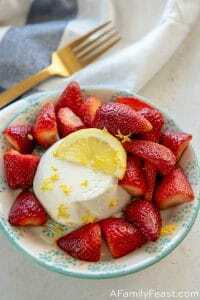 and thought we could do something similar for Valentine’s Day. We bought some inexpensive heart-shaped silicon trays at the store along with some candy melts (both white chocolate and dark chocolate). 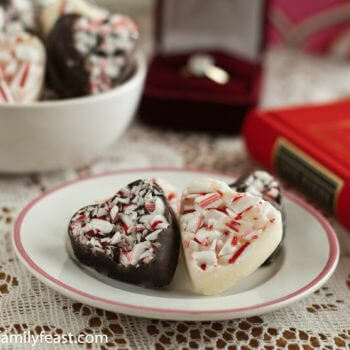 After crushing the candy canes, we filled the heart-shapes with the peppermint pieces, added melted chocolate – and half an hour later, after the candy had cooled, we popped the peppermint hearts out for a sweet little Valentine treat! If you really like peppermint, you could add in peppermint extract to the melted chocolate like the recipe we adapted – although be sure to use an oil-based extract. Many extracts contain water, and if water is added to melted chocolate it can make the chocolate ‘seize’ and you will lose the smooth, creamy consistency you need for this recipe. 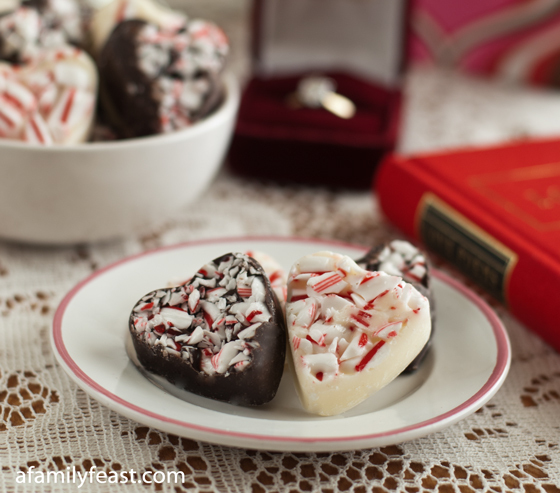 We skipped the extra peppermint and thought that the balance of peppermint to chocolate flavors in these peppermint hearts was just right. Place the candy canes into a gallon-size zipper seal bag and seal the bag, making sure to remove most of the air from the bag. With a rolling pin, crush the candy canes into small pieces. Pour the crushed candy canes in a fine strainer placed over a bowl to sift out the candy cane dust. 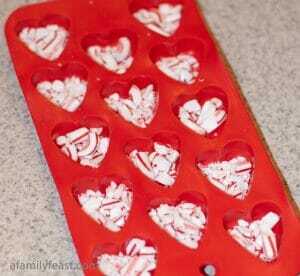 Divide the remaining crushed candy cane pieces into the heart-shaped silicon tray. Set aside. 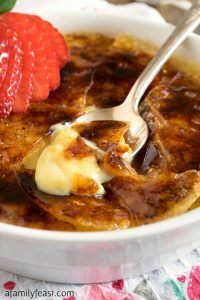 In the bowl of a double boiler, melt the one bag of chocolate and a 1/2 teaspoon of the canola oil together, stirring frequently until completely melted and very smooth. Remove the chocolate from the heat and spoon into the heart-shaped tray, filling each cavity completely. 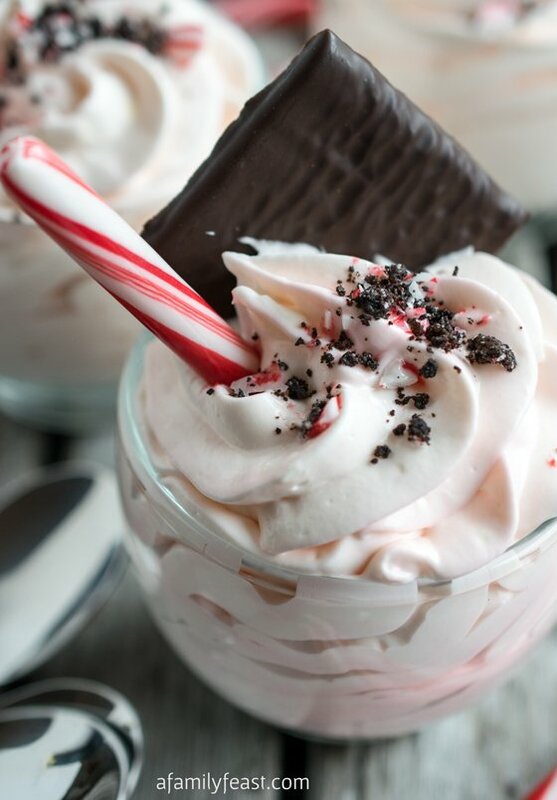 If necessary, push the pieces of candy cane down into the melted chocolate. Using a chopstick or other straight edge, scrap the excess chocolate from the tray making sure that the chocolate is flush with the edge of the tray. Repeat using your second type of chocolate if desired. Allow the chocolate to set at room temperature (approximately 30–45 minutes) or place in the refrigerator if you want it to set up more quickly. Gently press the peppermint hearts out of the tray for serving. We recommend that you store these candies in the refrigerator for best results. 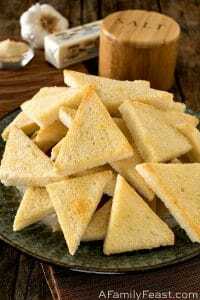 I love these – so easy and yummy! We still have candy canes left, so perfect idea!